Kodak Home Movies Expensive? Ad 1956 This is a June 18, 1956 advertisement. It is a nice color ad from Eastman Kodak Company of Rochester, NY. Pictures a man at the beach with his movie camera and it reads, ""Home movies expensive"" No Sir! Kodak now brings you a movie camera for only $29.95."" In excellent condition. Photo is taken through plastic and may show wrinkles or crookedness that is not in the ad. This magazine tear sheet measures 10 1/4"" wide by 14"" tall. 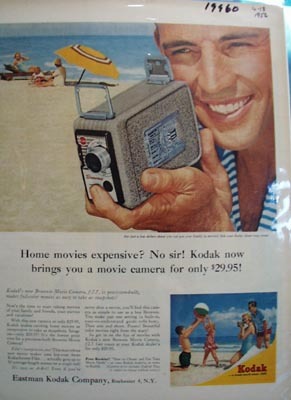 Items Similar To "Kodak Home Movies Expensive Ad 1956"